When you migrate from ACS to SAS, you only need complete below 4 tasks listed in Appendix F: Apply the 2018 update to migrate from ACS to SAS. 1 Follow the steps in Appendix A: Create a new Service Bus namespace to create a new SAS Service Bus. 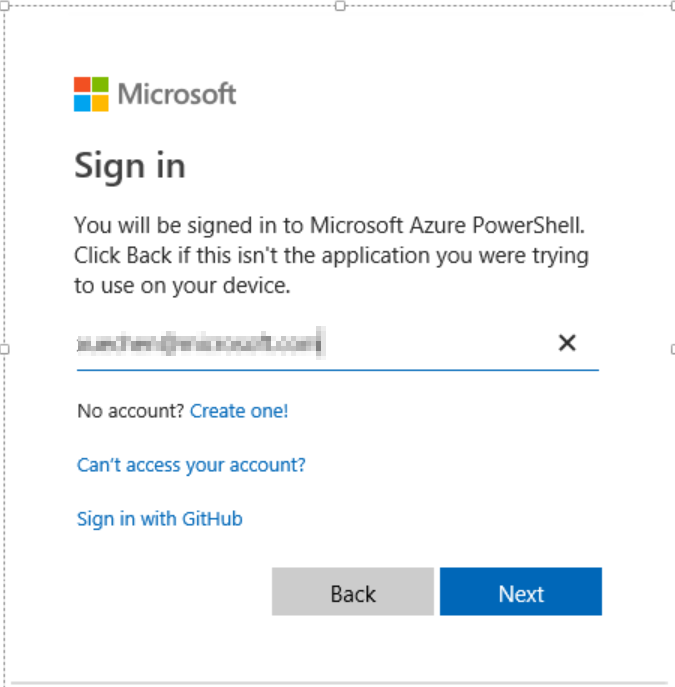 2 Follow the steps in Appendix B: Configure shared access policies, so that you can provide the key as the Azure service identity password in the connector parameters. 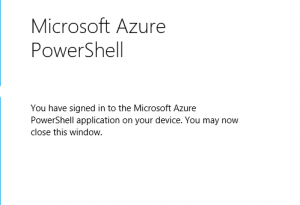 3 Install the latest connector, and update the Azure service namespace, Azure service identity name, and identity password from the previous steps. Note: The latest connector is not backwards compatible with ACS. Once the latest update is applied it will no longer work with ACS. The previous ACS solution is set to be deprecated on Nov 7, 2018. 4 In AX 2012, In the Settings for workflow form, update the Base URL to approve/reject workflow field with the details of the new Service Bus. This blog only focuses on some difficulties you might experience in item #1 when you create SAS service bus with the Azure power shell. When you follow the sample power shell commands in the Appendix A, you might run into some errors and cannot proceed. 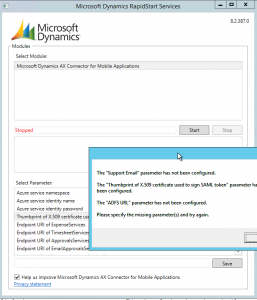 This blog also shows you some screenshots after you complete the configuration and test the feature with email approval. 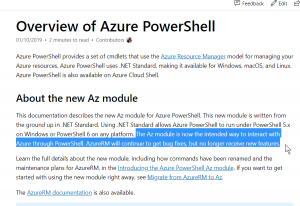 From below overview of Azure power shell, we know there are 2 modules for Azure power shell, meaning there are 2 different sets of Azure commands you can use to run the Azure power shell commands. 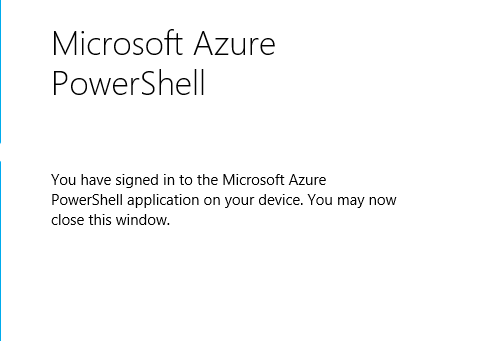 Unfortunately, the white paper is using the AzureRM module and I was not able to go through successfully. Instead, Az module works well for me. So, I recommend you use Az module as well to proceed. 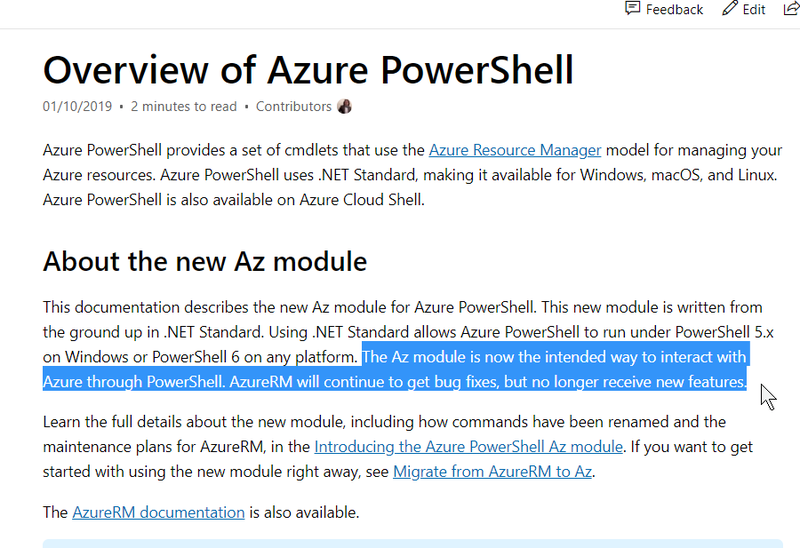 Az module is also recommended as you can see from below overview screenshot. Use Connect-AzAccount instead to proceed. 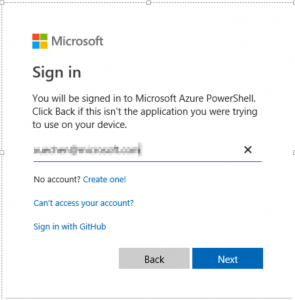 Step 3 to check and select the Azure subscription ID. 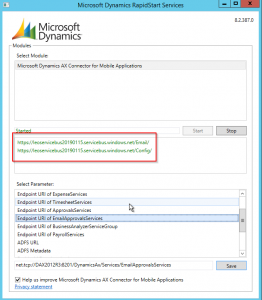 Create the service bus with power shell command. Note you need to create the resource group manually on Azure portal before your run the command. Otherwise you will face below error. Note the diagram in whitepaper to elaborate this command is really confusing and sort of wrong. Below is screenshot from whitepaper to elaborate the power shell commands to create service bus, however it’s using AzureRM and has some issue in particular with explanation of the parameters. Below is my sample command I used to create my service bus. You can simply follow it to create your own service bus. It will take less than 1min to create the service bus with the Azure PS. Then you’ll get below output. Save it somewhere. Install-Module -Name Az -AllowClobber Install Azure PS Check windows PS version. Make sure 5.1 at a minimum. As of now (Feb 2019), version of the latest mobile connector is 8.2.387.0. Note – you always need to download the latest mobile connector from above link to configure this feature. Due to the topology change, old connector doesn’t support latest SAS. Mobile connector doesn’t have to be installed in AOS servers. You can install it on any server you like. No AX component is required for mobile connector. If you run into below error when opening mobile connector UI, this is because the mobile connector service is in Stopped status. Simply start it from windows service list then you’ll be good to fix this issue and start the UI. 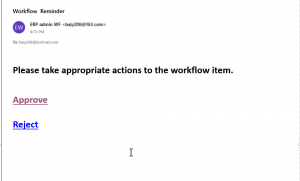 ADFS is not required for workflow approval via email. 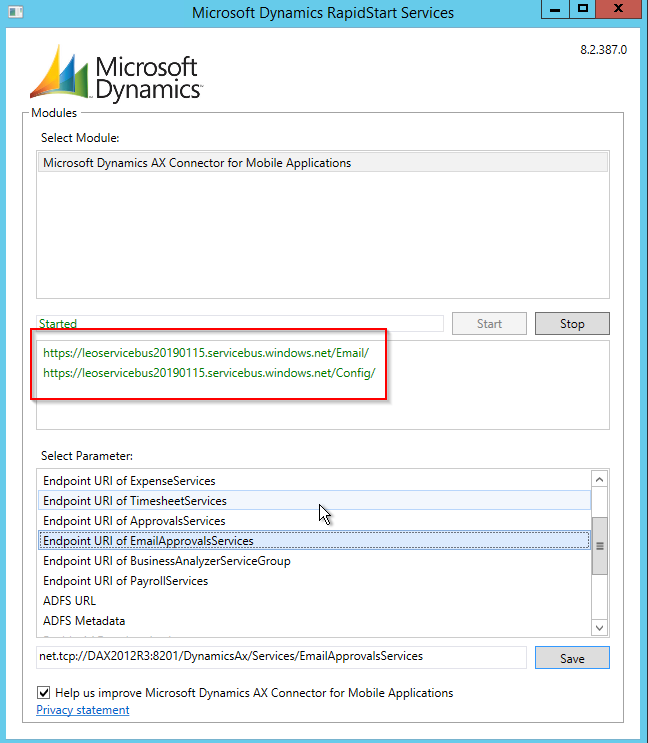 So, you can enter any value when configuring parameters on connector UI for ADFS. Only 4 parameters as below are required for workflow approval via email. All rest you can just provide some dummy values for them. 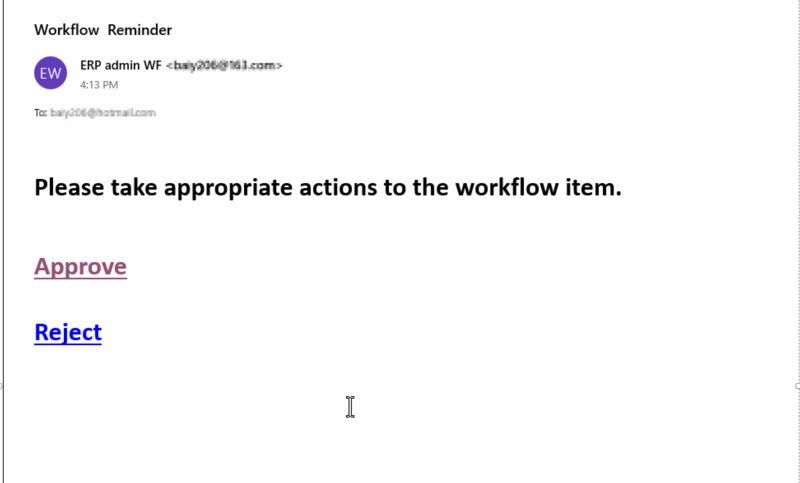 Below is my received sample email for workflow approval. 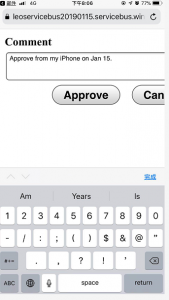 When you test the approval via email by clicking the link in email, you might get below error information and cannot proceed with approve/reject. 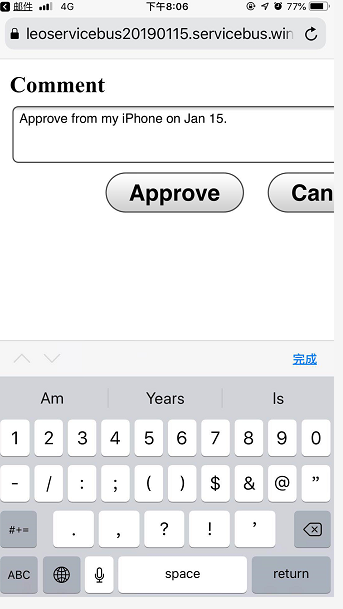 This issue is caused by wrong value (or even empty value) for EmailApprovalService on mobile connector UI. 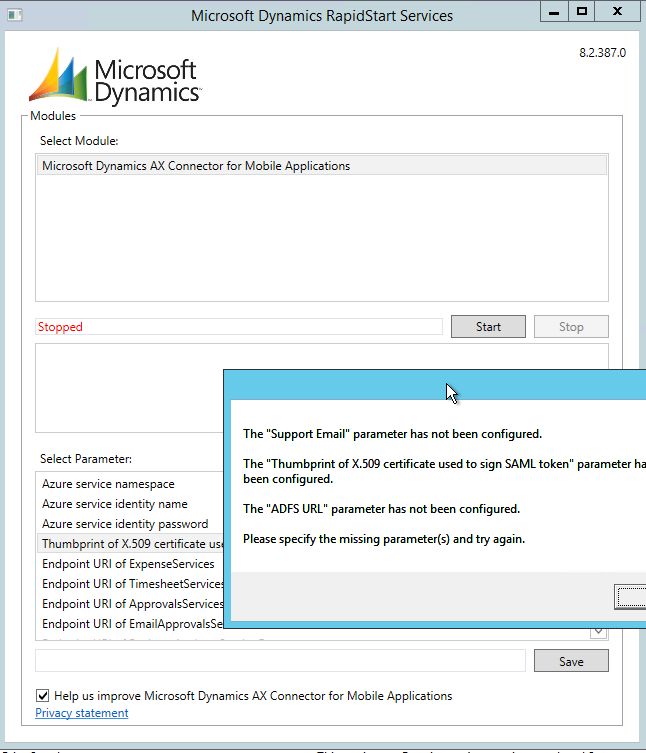 You need to fix the connector parameter by providing correct value for parameter EmailApprovalService (this is from the step #3 – create inbound ports, you need to create it manually in AX > inbound ports form. More guidance can refer to the whitepaper for workflow approval via email), you’ll get 2 services showing in the connector UI (Email & Config) which is expected. And above issue you see from web browser will be gone.